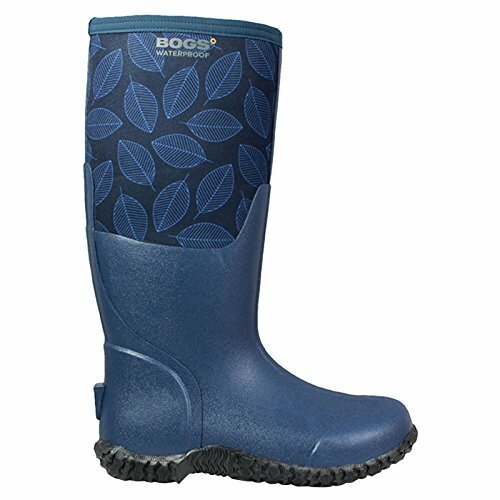 The Carver Tall Leafy wellington boots from Bogs are ideal for outdoor activities and have a temperature comfort range of up to 5F/-15C. These wellies are manufactured from durable hand-lasted rubber upper and a four way stretch inner bootie for comfortable cushioning and feature a stylish leaf pattern design. The rugged rubber overlay extends calf-high to ensure full protection. The stretch-fit topline binding on this pair of boots comfortably snugs your calf for a secure fit that keeps warmth in and the cold out. The lining of these mid-calf boots is made from Bogs Max-Wick textile with 5 mm waterproof Neo-Tech Lite insulation to keep your feet dry and warm. The removable, contoured, foam insole is treated with DuraFresh bio-technology to fight unwanted odours. Finishing these tall wellington boots is the durable, shock-resistant, non-slip and non-marking rubber sole with aggressive treading.